"The Snowy Mountains Scheme is undoubtedly one of the civil engineering wonders of the modern world. Built over a 25 year period from 1949 to 1974, it diverts water for irrigation west to the Murray and Murrumbidgee river systems and produces clean, renewable, hydro electricity through a complex integrated infrastructure which includes sixteen major dams, seven major power stations, 145km of interconnected tunnels and 80km of aqueducts." 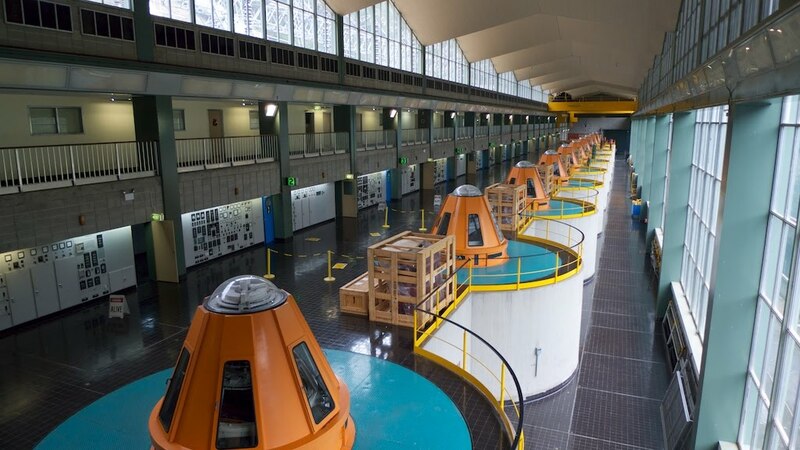 As we travelled across the Great Dividing Range, we saw many of the lakes and dams created by the scheme and we visited one of the Hydro-power stations - Murray One. It was not running because they only sell power to the Australian grid during peak periods when the price is highest. They have the advantage over coal power stations of being able to run off up to full output in about 90 seconds! The site seems to be all present again, after some disruption. Blogger is stopping support of blogs maintained on one's own server using FTP, requiring our blog page to now be hosted by Google. The static pages are still where they were, so some DNS 'jiggery-pokery' was required. The dust has settled and it all seems to work. Yarrangobilly Caves are located within Kosciuszko National Park in southern New South Wales. We visited them when we camped in the area at Old Adaminaby - the site of a township that was relocated during the construction of the Snowy Mountain Scheme; it's now a lake. There are several caves open at Yarrangobilly. 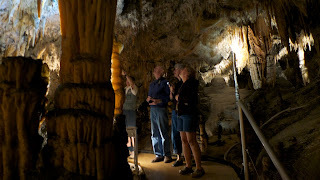 One is open for self-guided tours but the best can only be seen on a ranger-guided tour. We toured the Jersey Cave and, although we have both visited several excellent cave systems, this was one of the most beautiful, in terms of it rock formations. Australia's capital is Canberra which is in a small piece of Federal territory, the Australian Capital Territory ACT - much like Washington and DC. We spent a day in the city and visited two tourist sites. 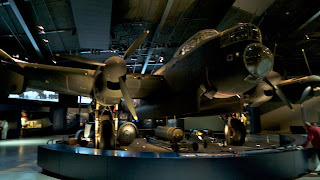 First was the Australian War Memorial. This combines a traditional War Memorial, remembering fallen soldiers, with an excellent war museum. The museum has aircraft, guns, uniforms and artifacts covering the First World War to the present day. There were several excellent light and sound shows reconstructing historical events. Then we went on to the National Botanic Gardens for lunch and a wander through the trees and plants. We're staying at a caravan park in Queanbeyan - what a great name, however it's pronounced! We spent a couple of days in Sydney. We spent nearly a month in Sydney last year after we returned from New Zealand but we left a couple of things undone. This time we actually stayed in the same caravan park, well outside of Sydney but within reach of the city rail service. 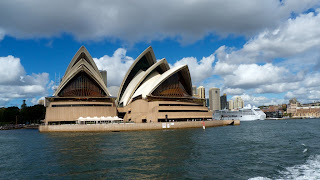 Our first outing was to attend an opera performance in the Sydney Opera House. We chose Guiseppe Verdi's La Traviata. We thoroughly enjoyed it even though we are not opera buffs. We had seen Grand Opera before, but not recently. On the second day we visited Taranga Zoo, a ferry ride across Sydney Harbour. We generally love looking at animals and birds, and focused particularly on the Australian ones (although the zoo has sections devoted to Africa and Asia). However, we failed to find a platypus in the platypus exhibit - we've had more luck in the wild! Ginger has discovered a new hobby - fossicking for sapphires! The northern part of New South Wales has been mined for semi-precious stones for many years and now its major tourist attraction is the possibility of stumbling over some undiscovered gem. 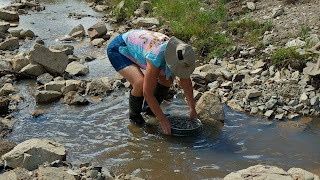 We stayed in several campgrounds in the area and visited several sites for fossicking. Many campgrounds sell unsifted sapphire workings in bags allowing one to fossick in the comfort of one's own campground. One campground had a creek-bed to fossick in within its boundary. Nothing spectacular has turned up yet, but Ginger is still hopeful. 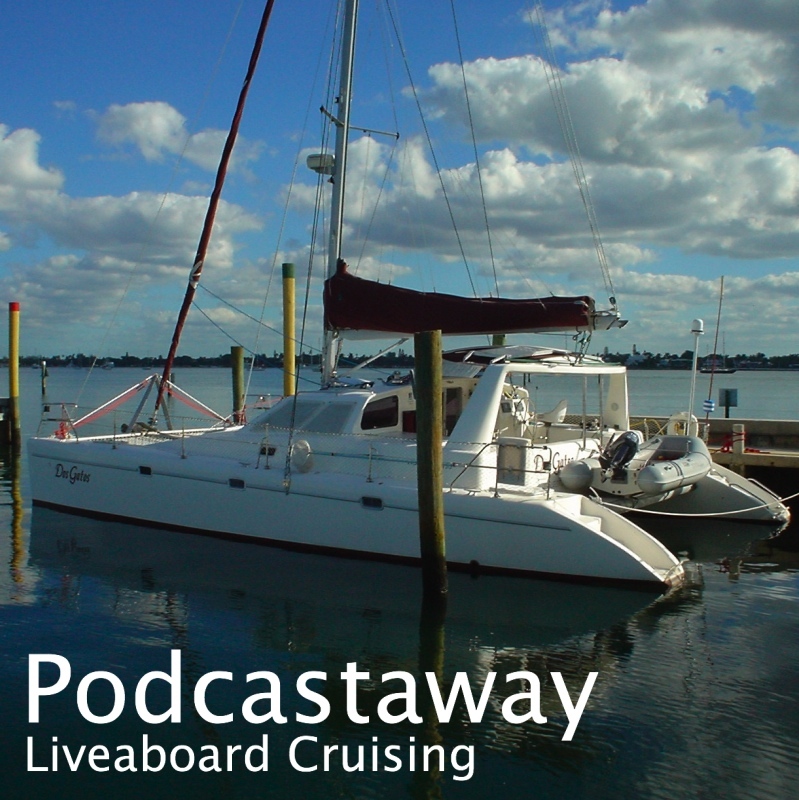 Last Saturday we got two phone messages suggesting that we call the marina in Bundaberg as there was "a situation" with Dos Gatos. 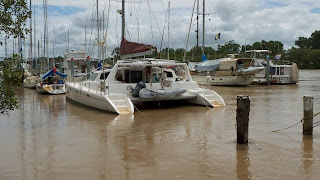 It turned out that the Burnett River was in flood - due to the huge amount of rain that southern Queensland has received - and many of the boats and moorings had washed away down the river! Dos Gatos had apparently dragged its mooring 200 yards before coming to a halt - one of very few boats to come to a halt! We immediately drove north to Brisbane (300km), to be within train range, and Martin took a trip back to check on the boat. Dos Gatos had been tied alongside a scallop trawler and was only moderately damaged. The starboard bow has some cracks and gouges - well above the waterline - and there are scuffs on both sides, presumably due to contact with other boats. Everyone said how lucky we were! She was then moved - so the trawler could go trawling - and is now tied between a marina finger and the separate trawler maintenance pier. (see pic above.) The marina staff will move her back out onto a mooring when the river rate of flow reduces such that the remaining mooring buoys pop back to the surface - they are currently invisible under water! They will probably have lost some, but won't know which ones until then. All the boats on the moorings have reportedly been accounted for. None sank and none have major damage. However, one boater was badly injured when he was crushed between two boats while trying to free trapped weed. It's the huge amount of water hyacinth washed down the river in flood that causes the problems. It builds up on boats, buoys and lines and greatly increases loads. That's when things fail. So, Dos Gatos is safe again. We were lucky, anything can happen when a boat breaks free. Having said that, we now have hundreds of dollars in repairs for our next haul out. Still, on with the road trip!